Originally from Lihue Kauai, David Kuraoka is an artist and a teacher. He has been actively involved with clay for five decades. Early art influences at San Jose State University immersed him in the minimalist movement that followed abstract expressionism. 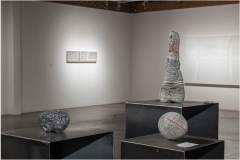 As a young artist pursuing a bachelor’s degree in fine art, he completed academic and studio requirements for degrees in painting, sculpture and ceramics. He chose to focus his Master of Arts graduate studies in ceramics. 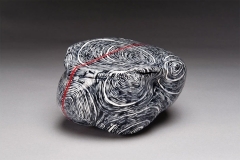 Later, he was awarded a PhD equivalent by San Francisco State University for his research in Americanizing raku, where he made simple, elegant forms that he subjected to raku and primitive open pit firing. Kuraoka began teaching at SFSU in 1971. He created an intensive, hands-on ceramics program at SFSU, was head of the SFSU Ceramics department from 1982 to 2008 and has been professor emeritus since 2012. Kuraoka was responsible for creating large, collaborative annual beach festivals that engaged ceramics and glass departments from all over Northern California for 15 years. He helped initiate a related event in Hawaii, where the Raku Ho’olaule’a has attracted artists annually for 40 years. He was honored as a Hawaii Living Treasure in 1987. During his professional career, he has developed different bodies of work. 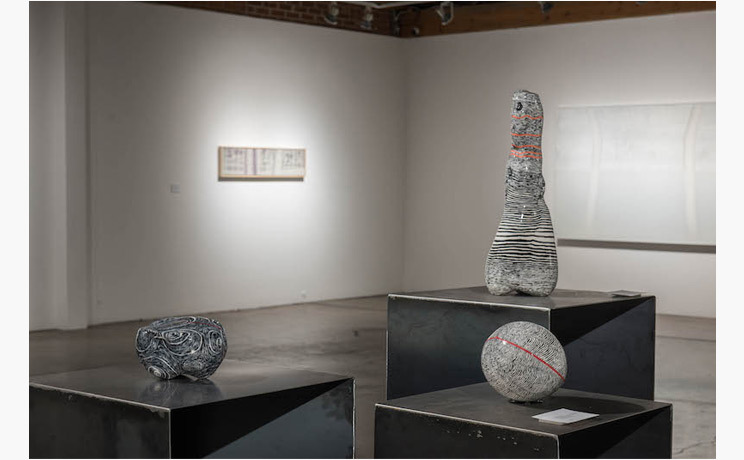 Among these are wheel-thrown and altered pit-fired forms; vessel-based ceramic and bronze sculpture; wheel-thrown porcelains; wall-mounted, handmade ceramic slabs; and large-scale extruded ceramic columns. In addition, he has created, fabricated and installed three major ceramic public artworks. 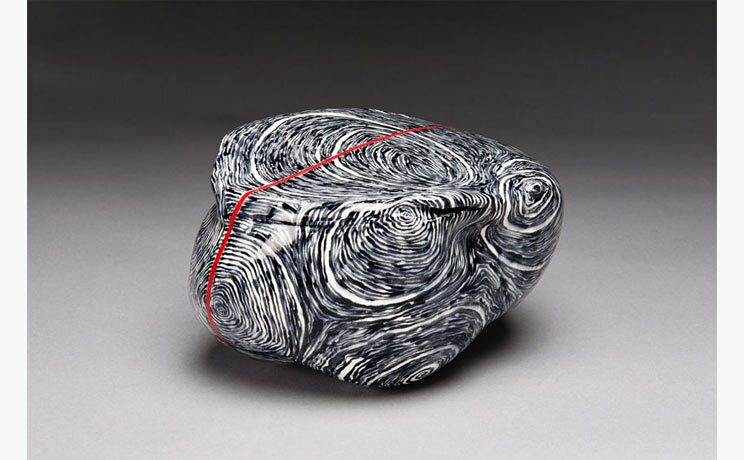 Kuraoka’s design philosophy in creating ceramic sculpture recognizes the beauty of natural forms, combined with a visual language that he believes is universal. His work is abstract and he describes his style as “simple, clean and crisp, ‘California Slick’”. David Kuraoka is best known for large ceramic pieces that are first thrown on a wheel, then further shaped by hand, burnished, covered with rock salt and copper carbonate, and fired in an open pit. He has long been involved in the process of pit firing, his favorite ceramic technique because of the rich, soft colors that result from the firing. Kuraoka’s experience has taught him how to set up the pit to get certain kinds of effects, but one of the fascinating aspects of the process for him is its serendipity, the unexpected ‘gifts of the fire’ that mark his simple, organic forms with smoky earth tones that evoke the colors of Hawaii’s landscape. Kuraoka begins by throwing a rounded vessel, subtly altering it by pressing and shaping. He then turns the form upside down and works freehand to create a new top or cap on which the clay is built up and expressively manipulated. The caps of the completed vessels undulate and swirl, resembling the volcanic topography of Hawaii’s islands. Before the pieces are fired Kuraoka burnishes them, rubbing the surfaces with a stone to create a beautiful sheen that enhances the colors and catches the light. In the firing, Kuraoka places sawdust, rock salt, and copper carbonate on the floor of the pit to get the distinctive reds, browns and blacks in his firings, loads the pieces and then fills the pit with split logs. David Kuraoka was born in Lihuʻe, Kauai and received BA and MA degrees from San José State University, and a Doctorate of Art from San Francisco State University. He is retired as professor of art and head of the ceramics department of San Francisco State University, and maintains studios in both San Francisco and Kaua‘i. Named a “Living Treasure of Hawai’i”, Kuraoka helped initiate the popular Raku Ho‘olaule‘a. His work has been exhibited nationally and internationally including at the Hawai’i State Art Museum, Honolulu; San Francisco Craft and Folk Art Museum, California; the Rotterdam Modern Museum of Art, the Netherlands; and the Tokyo Metropolitan Teien Art Museum, Japan.